"Entry in the International Encyclopedia of Religion, 2d edition"
From pre-Angkorian times to contemporary Cambodia, an attempt to summarize the diverse elements of Theravada Buddhism as it is practised by Khmer people nowadays. 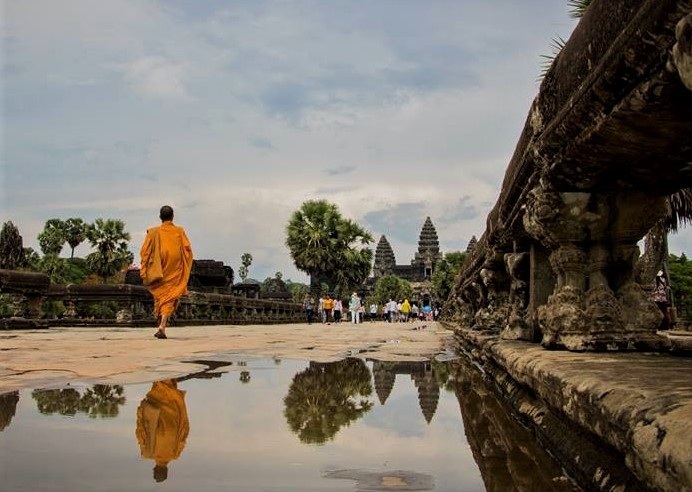 Syncretism, influences of Hinduism and mainstream Buddhism, permanence of local beliefs and traditions are considered through the different historical phases of Cambodia, the national motto of which remains "Nation-Religion-King". A professor of History at University of Wisconsin-Madison (USA), Anne Hansen has extensively researched ethical ideas and modern religion representations in South East Asia, with an accent on Theravada Buddhism. She is the author of several published studies, as well as the following books: At the Edge of the Forest : Essays on Cambodia, History, and Narrative in Honor of David Chandler (Cornell University SEAP Press, 2008), and How to Behave: Buddhism and Modernity in Colonial Cambodia, 1860–1930 (University of Hawaii Press, 2007).